Bali, Indonesia. July. 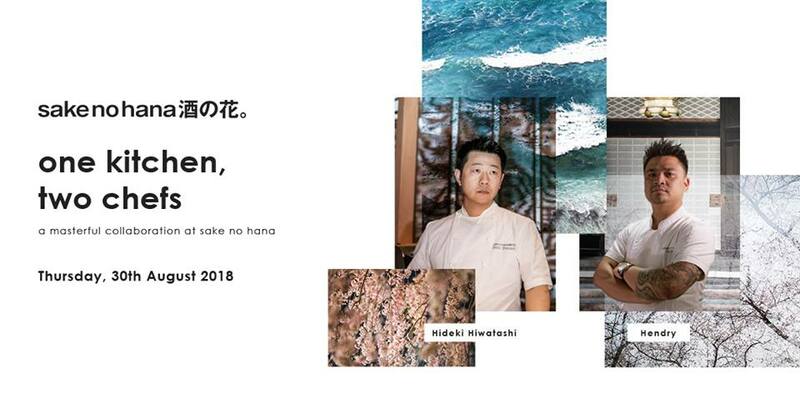 31, 2018 —Sake no Hana Bali, the jaw-dropping restaurant perched high on the limestone cliffs of Uluwatu within the chic environs of OMNIA Dayclub, has announced that it will be hosting its first exclusive culinary event, “One Kitchen, Two Chefs”, on Thursday, 30th August 2018. One Kitchen, Two Chefs is a special collaboration between the two highly acclaimed chefs that are currently at the helm of Sake no Hana Bali; Chef Hideki, the Hokkaido-born tour de force who brought the ethos and attention to detail of the restaurant’s Mayfair flagship with him when he conceptualised the menu for its very first island incarnation, and Chef Hendry, the new Executive Chef who has recently been given the honour of ensuring that Sake no Hana goes from new kid on the block to a leading light on the Southeast Asian gastronomic map. The evening will kick off with a 8pm cocktail reception on the Grand Staircase, where diners are invited to indulge in sublime sake cocktails in hand, then be led upstairs for a truly memorable seated dinner. Guests can expect a unique and thoughtful menu that masterfully bridges the two chefs’ generational and geographical gap. Working in concert with each other, the mouth-watering dishes at ‘One Kitchen, Two Chefs’ will be carefully crafted by both chefs. Dishes not to be missed include the buttery, melt-in-your-mouth “Kagoshima” Wagyu Beef Striploin, complemented beautifully by a bright, zesty yuzu aioli and accompanied by smoked vegetables, and the “Kyushu” Hamachi Namawasabi, which features fine slivers of fresh Hamachi tuna dressed wtih truffle pepper ponzu, fresh wasabi, and delicate truffle. Another stand-out for aficionados of Japanese cuisine will be the five signature rolls that are offered in the Gohan Sushi Experience. The meal will be punctuated by hand-crafted cocktails shaken and stirred by Sake no Hana’s resident mixologists, along with a carefully chosen selection of sakes from the award-winning in-house sommelier. Coupled with the opportunity for both a personal meet-and-greet with both the London-based maestro himself, Chef Hideki, and a very special introduction to the incredibly talented, newly appointed Executive Chef Hendry, One Kitchen, Two Chefs: will be a night that Bali foodies will want to snap up seats at, pronto. It’s set to make its mark as a very prodigious night — and the first of many stunning events you can expect from Sake no Hana this year.